A protest for affordable housing at City Hall. Photo by Laura Wenus. In a bid to bring more affordable housing and an end to evictions in the Mission District, housing activists and residents from the Mission and other parts of the city are gathering at City Hall today and rallying in support of a market rate housing moratorium. With SFPD barricades in place on the steps of City Hall to narrow the entrance and exits to the building, activists were beginning to gather at around 11:00 a.m. for their noon rally. By 11:30, about 50 had arrived. Activists inside City Hall said they planned to go to each supervisor’s office individually and announce their demands. Mercy Jimenez, of Our Mission No Eviction, was among them. By noon the crowd of activists has grown to more than 200, including those outside and inside. They filed in to the city hall building, going through a security scan one by one. Supervisor David Campos, coming from his office to meet the protesters, told newscasters that the Mission needs 2,400 new units of housing just to maintain the level of families in the Mission. “Our house!” the crowd shouted back at him. After singing a rendition of “This Little Light of Mine,” the group moved up the stairs and marched through the hall that leads to the doors of the supervisors’ offices. As the gathering passed by Supervisor Jane Kim’s office, the District 6 supervisor and staffers were there to greet the protest with a sign showing their support. Kim, and a short way along the hall, Campos, shook hands and exchanged the occasional embrace with the steady stream of protesters that moved past them. After making the rounds, the crowd stopped in front of Mayor Lee’s office. “Mayor Lee, can’t you see this is an emergency?” they chanted. They recited a list of demands, including that Lee ask owners of burnt buildings to provide the right to return to both businesses and residents, that homeless families be housed in empty units on Treasure Island and in the Presidio, and that 3000 units of new affordable housing be constructed. 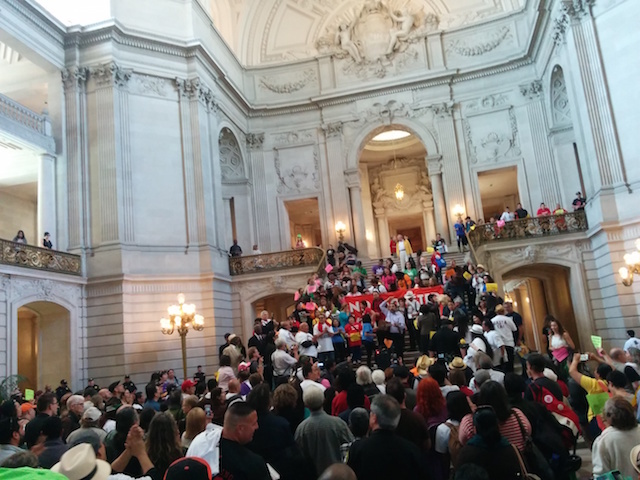 “Right now Mayor Lee, you are putting the budget for the city together and we demand that $150 million be put in budget for … affordable housing,” said activist Roberto Hernandez as the group echoed him, amplifying him as a human microphone. “With all the taxes that the city’s collecting right now, they should go to La Misión.” “Se ve, se siente, el pueblo esta presente,” the group chanted outside Lee’s door. It seemed the protesters were settling in for a long wait. Someone had ordered several pizzas for them, which were quickly distributed and eaten by activists who now sat, stood, or leaned in small groups around the atrium in front of Lee’s office doors. Ivy Jeanne, another Mission resident, has had her own close brushes with eviction. Her friend Laure, who declined to give her last name, said she used to live in a house in the Mission with two other mothers and their children. They dubbed it the “Mama House.” Their landlord kept their rent consistent for many years, but one year raised the rent the allowable percentage that had accrued. “We couldn’t take the hit, so we left,” Laure said. Now, she lives in Mission Bay in an affordable unit, but struggles there because her rent can still rise incrementally, but her income does not keep pace. 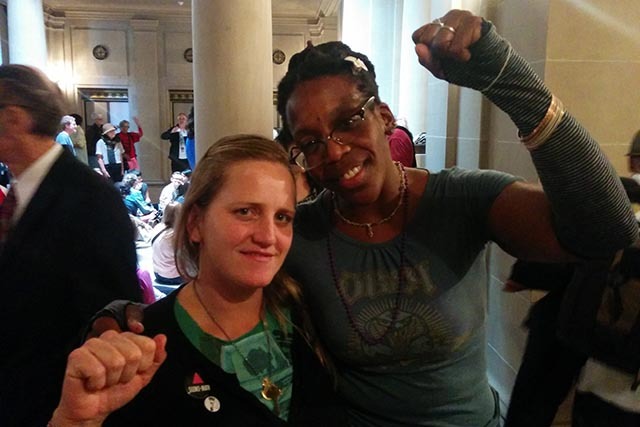 “I’m here because I don’t want to live in a city that uses hygienic metaphors that make it okay to kick out disabled people, to kick out poor people, to kick out people of color,” she said. 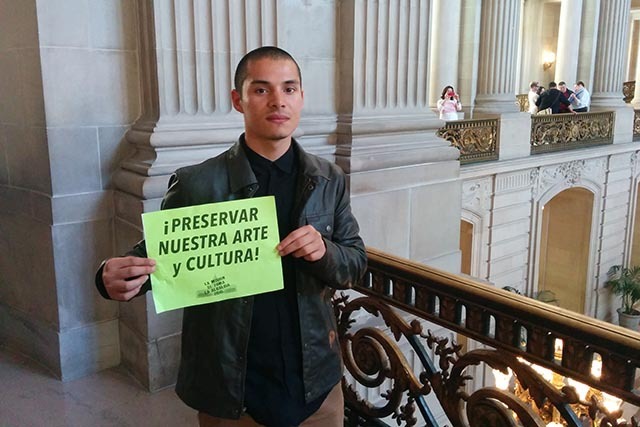 Carlos Saez, a student at City College of San Francisco, lives with his parents in the Excelsior, but said their situation is no less precarious. Their home, which they purchased in the 80’s, is still under mortgage, and the payments are too much for his parents to handle. “My folks work around the clock and they’re struggling to pay the bills. They’re looking at leaving the city,” Saez said. It’s not just his parents’ generation that’s affected by a rising cost of living. His grandmother used to run a daycare in the Mission, but she was recently evicted from her building. “We have all our memories there, but it’s just not the same,” Saez said. Edwin Lindo, of the San Francisco Latino Democratic Club, called the action a “victory,” and said a representative from the Mayor’s office had come out to take a list of demands. As for the mayor’s absence, that wasn’t a drawback, Lindo said. This is a sadly misguided protest. Stopping market rate housing production in the Mission will only increase rents and evictions. Building city-subsidized housing, if that is the aim, generally leads to increased crime and blight. This is a lose-lose initiative. I’ve been a Mission resident for 14 years, just 3 years short of Sheila’s 17 years. I could barely afford rent but scrapped together my savings for years and bought a place last decade because it was one of the few neighborhoods I could afford. Since I saved a little money a long time ago I won’t ever be evicted. This option was available to Mission residents over many decades. Mission housing has been expensive only in the last 5-10 years. If the protesters were so concerned about securing their own neighborhood they would have bought property for many many years when it was extremely cheap. Now they want free land and huge rent decreases. They missed a huge opportunity and are asking the rest of the city to bail them out. No thanks. Maria Zamudio lives in Oakland, not the Mission, yet she’s made herself a key player in District 9. So many of us complain the developers and techies who want to move to the Mission don’t live here and shouldn’t have a say in our local issues. Yet, Maria runs the monthly general meetings of Plaza 16, and lemme repeat she lives far away from the BART plazas at 16th and Mission, and you look at photos from today’s speaker platform at City Hall, and there she is. She was also in front of plenty of cameras at the Maximus March 4th action, showing she likes media attention, which isn’t such a bad thing but she lives across the bay. Regarding Edwin Lindo’s statement about the action was not to get the mayor’s attention, I have to ask, then why go to City Hall? Seems as though the point of today was to get lots of folks inside City Hall, hear from the same old speakers and the some old tired organizers running the show without a plan, march around and chant, knock on the mayor’s door, sit in and eat pizza, then leave. Ok, now what about a public follow up meeting open to all to assess the impact of today? Let’s see if Plaza 16 leaders deliver such a much needed forum.